Adknowledge Curtis Fullmer an interview at LeadsCon New York. I was able to catch up with Curtis Fullmer Vice President, Affiliate Marketing at Adknowledge, Inc. a few weeks ago at LeadsCon New York. Curtis Fullmer is looking for affiliates and offers. Curtis Fullmer is also a bullfighter. Yes that really is him. 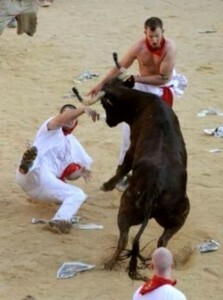 Yep, you can tell it’s him really bullfighting because you can see his trademark armband.